(HU 623 924) "Haltadans", a cairn closely comparable with "The Fiddler's Crus" (HU69SW 7) with which it has been confused by the O.S. and which lies 550yds to the N.W. It consists of a ring of stones 37' in diameter and now containing 22 earthfast and several loose slabs. The surviving set slabs are set edge to edge, and it is probable that a gap in the SW is original. At a distance of 5' inside and concentric with the stone ring is a low bank with a gap of 5' in the SW. The centre of the space thus enclosed is occupied by two earthfast boulders of rectangular section. 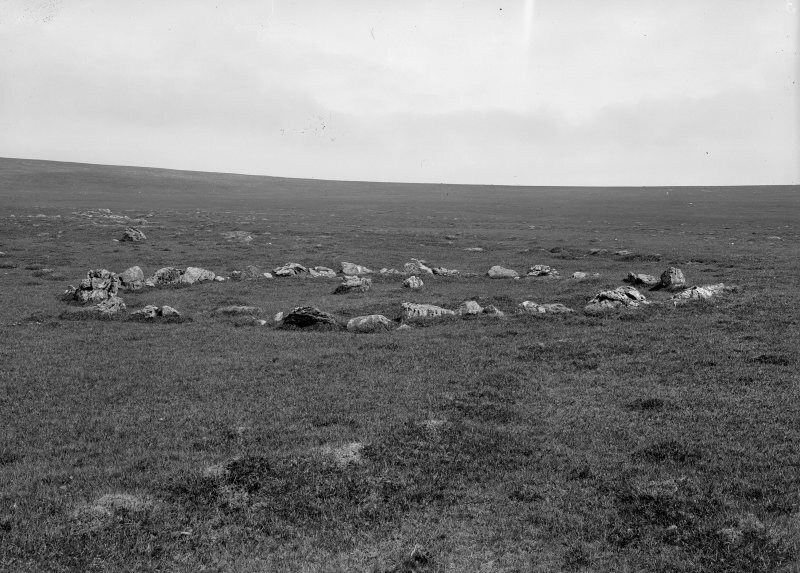 Nothing is known about this class of cairn, but it has obvious affinities with ring cairns and hengiform barrows, and a general flavour of the Early Bronze Age. Haltadans at HU 6220 9340, as described by Feachem, and illustrated by RCAHM. Visited by OS(AA) 16 May 1969.